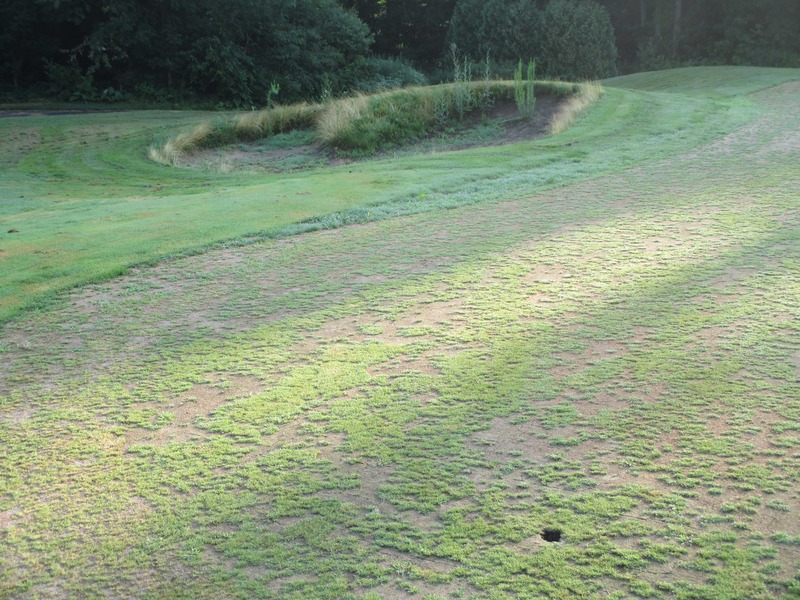 The Gillette Ridge Golf Club, which was abandoned before the start of the 2015 golf season, appears to be on the way back. For the past few weeks grass has been mowed and the irrigation system has been running. There is also a posting for the superintendent position. The reclamation of Gillette Ridge will not be an easy one. This is the 11th green photographed in July of this year. Apparently, Century Golf Partners, part of the Arnold Palmer Golf Management network, will run Gillette Ridge. “According to a Sept. 1, 2014 story on HartfordBusiness.com, MDM Golf of Gillette Ridge, LLC, which owns the course, filed for Chapter 11 bankruptcy in August of 2014 . MDM is owned by former club professional and Connecticut resident Matt Menchetti. According to sources familiar with the situation, Cigna will regain ownership of the golf course and property. MDM sister entities managed the two municipal golf courses in Hartford and the one in East Hartford before having the contracts cancelled.